Exams can be very stressful for some - they often ask you to cram a whole semester's worth of information into a couple of hour's work. Start your preparation early so that you feel confident going in on the day. If you feel like you need extra help coping with the stress or anxiety of exams, the La Trobe counselling service provides workshops and group sessions to develop strategies that will help you prepare. It is important to start your exam preparation early to give yourself the best chance of retaining the information you need and giving it the meaning that will help you to excel in your exam. It is easy to become overwhelmed by the hugeness of the task ahead of you and so to avoid facing your anxieties through procrastination. Drawing up a workable study timetable will increase your sense of control over the task (and hence, reduce anxiety) and also will help you to become more efficient with your time. It is important to be realistic - don’t set impossible goals for yourself. Allow for the limitations of your attention span. Avoid scheduling large slabs of time for one subject. Alternating subjects for your study will help you to sustain your concentration and interest. Don't cram - several reviews are more effective. More material will be retained in memory if you schedule several review times over an extended period rather than one long session. Work in terms of tasks not time. Rather than having a vague aim to ‘study biology for two hours’, set a particular section of work for each study period. A sense of achievement comes from successfully completing small tasks, and breaking the work up into smaller sections makes the whole process of revision seem less daunting. Review your approach. If your study plan is not helping you to revise effectively, review your strategies and consider making changes. For example, you may have attempted to fit too much into your timetable, or your timetable may not be flexible enough to accommodate unexpected events. Resist the temptation to throw away your plan and allow yourself to fall in a heap. Some minor adjustments may be all you need to stay on track. Make sure you include some recreation time. If you allocate time for such activity you will be less tempted to chuck it all in and waste time avoiding work because of the unrealistic demands you have made upon yourself. Your method of revision should consider the nature of the examination. Find out from your lecturers what the structure of the exam will be and what subject areas will probably be on the exam. Course outlines and handouts can provide important information about exam times, locations, formats and requirements. Exam review sessions are invaluable and not to be missed! They will give you an idea of what will be on the exam and will give you a chance to ask questions. Former students may also be able to give you helpful information about what to expect. Use past exam papers to direct your study and take notes This will give you an idea of the sorts of questions and overall structure of the exam; however, do not assume that the same format will be used this year. Lecturers change their exams over the years, so double check with your tutor to make sure of any changes. At this stage, use your lecture notes and other sources to give full answers to past exam questions. A good strategy is to practice writing responses to past exam questions throughout the semester. When you finish a topic, check to see if there is a related past exam question. It will be easier to prepare a response while the topic is still fresh in your mind. You can use these notes later to revise for the exam. Practice past exam papers under exam conditions Do this closer to the exam time. Without looking at your prepared answers or other notes, test your recall of knowledge and your ability to write under time constraints. Predict possible questions Look over your lecture notes and make a list of probable questions. Think about the sorts of questions the lecturers asked in the subject and take note of any areas that were highlighted as important. Prepare answers for some or all of the questions you predict. Effective revision enables you to get material from your short term memory into your long term memory. Long term memory is like a library – information that is placed in it in a systematic way is more likely to be retrievable. Below are some tips to help you revise. Try to comprehend the overall structure of the lectures. What were the main concepts? How did the lecturer set out her argument? Pay particular attention to establishing how all the individual pieces of information fit together to produce a coherent whole. It is easier to remember individual details when they are grouped into mini-sections. Make a list of the areas you need to know in each subject and write down headings and subheadings. Add material you have learned from your reading to your notes according to the subject area. Underline, highlight or write comments in order to emphasise the idea of each section. Written summaries for each topic - Numbering each point can help with recall in the exam. Diagrams. During the exam, it is easier to recall information which has been represented diagrammatically. Colours are particularly helpful to stimulate the memory. Check out James Cook University's mind mapping resource and also another great independent mind mapping resource. Audio. Try recording your summaries or prepared answers to practice questions onto a portable recording device. Comprehension improves if you listen and read at the same time. The other advantage for those who like multitasking is that you can listen while doing something else like walking, ironing or sitting on a bus! Many students, after having read over material several times, assume that because it looks very familiar they have learned it. Simply being able to recognise material does not automatically mean that you will be able to recall it later in the exam. When learning definitions, divide a piece of paper in two vertically and write the words on one side and the definitions on the other. Cover the words and practise recalling them, using the definitions. Then cover the definitions and practise recalling them, looking at the words. Use cards with the subject on the front and the information to be recalled on the back. Look at the subject, practise recalling the information, then look on the back of the card to check. If you need to memorise diagrams, make large ones and stick them up on your walls. 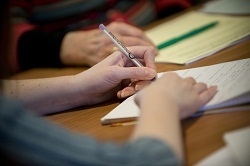 Revise with a friend or a study group to share knowledge and exam strategies and to practise recall. Although a small amount of stress before exams may aid your performance, too much anxiety will negatively affect your exam performance. levels. If you have trouble getting organized and making a study plan and would like someone to help you, see a LAS advisor. Look after your health. Get plenty of sleep, eat healthy food and try to find time to exercise. Many people find that yoga and breathing exercises can help keep them in tune both physically and mentally. Keep things in perspective. Although it may seem at the time that the next exam will be the most important event in your entire life, this is probably not really the case and thinking like this only puts more pressure on yourself. Take a break. Notice when you are tired or losing concentration. If you feel like this late at night, you could make more effective use of your time by going to bed and getting up earlier the next morning to study when your mind is feeling fresher. A good way to refresh a tired mind is to go on a brisk 15 minute walk. A 15 minute TV break is mind numbing rather than refreshing and can easily turn into a one hour break. Set rewards for yourself. Rewards for good progress can assist with motivation. Try setting yourself a goal and rewarding yourself when you achieve it. A reward can be as simple as a cup of tea or your favourite TV programme. Around exam time, the La Trobe counselling service runs group seminars/sessions on exam success. La Trobe's counselling service also has information about study timetables, goal setting and planning and priorities. If you feel overwhelmed by exam stress or study motivation problems and unable to cope, you may like to make an individual appointment with one of the counsellors. Exam questions will vary greatly across faculties and disciplines. Find out how to tackle these different forms so that you feel confident no matter what the exam throws at you! Many students believe that to answer a multiple choice question they need only be able to recognise material and so need only do minimal revision. A well-written multiple choice examination, however, will require you not only to have a thorough knowledge of the subject, but also to be able to integrate information and to discriminate between similar answers. Carefully note the connecting words as well as the key words, in both the question stem and possible answers. Think carefully about sentences with words such as never and always. If there is an answer that you think is correct, check to make sure that the others are incorrect. You may find that you’ve been a bit hasty. Does the question contain any clues to the answer? Do the alternative answers give clues? Through careful analysis and a process of elimination it is possible to arrive at the correct answer even if at first sight you did not have any idea. If you are not quite sure of an answer, guess. Unless of course there is a penalty for incorrect answers. Determine before you begin whether or not there will be such a penalty. Do not pay attention to old myths such as, ‘if you don’t know the answer always tick the first box’ or, ‘always pick the shortest or the longest answer’. An educated guess after careful consideration of all the options is more likely to score an extra point. Another popular myth is that if you change your answer you are more likely to change it to an incorrect answer. In fact, studies have been done which prove just the opposite. Your main aim is to provide a clear, logical explanation that can be followed easily by your examiner. Short answer: summarize the main points in the first sentence. This means that you will have to carefully plan your answer first. Also, if you run out of time your examiner will be able to see where you were heading with your answer. Essay: your introduction should outline the main points of your argument. The body of the essay should consist of a logical sequence of these ideas. Have one idea per paragraph and express the main point of the paragraph in the first sentence. The conclusion should provide a summary of your argument. Don’t rush into a question. Give yourself time to think about and plan your answer. Before writing, make jotting notes or a brief outline: this will aid your memory if you have a mental block later. If you run out of time or misjudge things and still have a question to go, then write notes/points. Set out a plan of how you would have answered the question if you’d had time. In a short answer question, content must be strictly relevant. Make sure that your answer is clear and concise, padding only wastes time. If appropriate, include clearly-labeled graphs or diagrams: these may help you to remember things which you have forgotten or provide you with a basis for your writing. These types of questions are most common in science, mathematics, engineering and accounting. Read the question carefully: take note of each part of the question you will have to address. Check carefully what data have been given and what have been left out. Think about which principles could be applied to the data. List the formulae you will need to answer the question, without placing the given values in them: this will help to avoid unnecessary slips resulting from a faulty transcription of the formulae. Decide the order of the steps you will have to take in order to get to the answer. Double check your arithmetic, etc. before moving onto the next step. Make sure you haven’t misplaced any decimal points or made an incorrect substitution in the formulae. Include all of your calculations in your answer: that way even if the final outcome is incorrect, your examiner will be able to see where the mistake was made and may still award you some marks for your approach to the question. When answering physics questions, carefully define all symbols and explain in words what you are doing. Do not write P= 30m, Q=6m, and so on; instead, write P is the length of the ruler, etc. It is extremely important to write out an explanation for what you are doing because examiners will give points for method even if you end up with an incorrect result. Avoid making computations that are not asked for and use formulae as much as possible. Don’t use too many significant figures: your calculator provides 10 figures, but you only need three. Make sure you write down the units and check to make sure that they are correct throughout. If the dimensions of the final result do not seem right, check your computations again and if you still come up with the same answer write down whether or not you believe it to be valid and provide a possible explanation for such a result.